This HSNY continues their lecture series this Weds. on March 27th with Linda Yang, author of The City Gardener's Handbook. "Linda Yang is an avid city gardener, former New York Times garden columnist, and author of The City Gardener's Handbook. She will discuss important steps for understanding your space - rooftop, terrace or yard - and the plants and design elements to make it glorious. The current edition of her book, with a Foreword by HSNY Librarian, Katherine Powis, will be available." You Grow Girl was listed in Real Simple's March 2008 list of 'Best Blogs' - Gayla Trail has been blogging for 8 years! 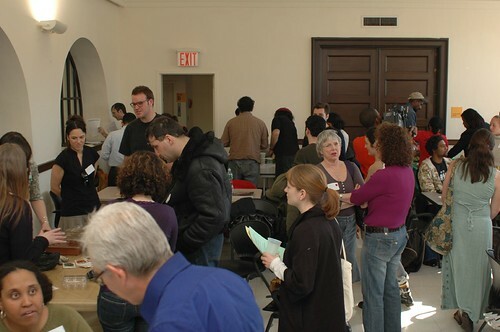 Greening Flatbush was an event that included..."presentations and experts on hand for container gardening, composting with worms, tree identification, Asian Longhorned Beetle/Anoplophora glabripennis, and GreenBridge, the Brooklyn Botanic Garden's community horticulture program." It looks like a great turnout, and a great community event for Flatbush. Near Arctic, Seed Vault Is a Fort Knox of Food - "Well, we are losing biodiversity every day — it's a kind of drip, drip, drip. It's also inevitable. We need to do something about it." The NY Times reports on the global network of plant banks being created to preserve seeds.